An office refurbishment at City Gate House, in London’s Southwark Bridge Road, was carried out by landlord Land Securities to help ensure the continued occupation of the building by the current occupiers. The prestigious 85,000 sq ft building includes an IT datacentre with occupiers including a major disability transport organisation. Among the additions to the building was a new glazed stair tower. 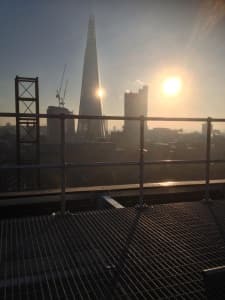 Greenwood was called on to deliver a turnkey package for the rooftop services including shrouding louvre panels, access steelwork and flooring for safe maintenance access in future. In addition, the glazed stair tower required both daily ventilation, to minimise the impact of solar gain, and fire engineering to ensure the stairs remained a safe exit route, in the case of fire. A fully fire engineered ventilation system was designed and supplied to the main contractor on the project.